You are here: Home / Toddler Talk Thursday / Toddler Talk Thursday: Toddler Games! Toddler Talk Thursday: Toddler Games! Welcome to the tenth week of Toddler Talk Thursday! Where Family and Life in Las Vegas, Crazy about my Baybah, and My Life as a Sippy Cup Mom Talk all things Toddler! Toddler Talk Thursday was created as a place for moms and dads of toddlers to come together over a weekly topic and share ideas, go-to toys, or products. It is a great way to meet other bloggers of toddlers. 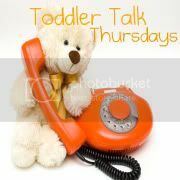 Each week the topic will be different; we invite you to link up, share your weekly Toddler Talk!! Each week the hosts will travel around to each blog that links up, and pick an idea, story, or picture they think was a great example of that weeks topic. In order to qualify for this you need to blog about this week’s topic, and follow the hosts. Comments letting us know you are participating are always great too. If we choose your blog, we will link back to your post the following week. I love playing games with Hayden. I think my favorite game is the “Clean Up Game”, LOL! After he makes a mess either in his room or the living room we sing the “Clean Up” song and then hurry to get all the toys put away. He loves it and so do I! He has really been into Chasing and Hide n’ Seek lately (as well as you can play Hide n’ Seek with a toddler!) and we have a lot of fun with that as well! We also do alphabet and animal flashcards, which is one of his favorite “games”. He is always bringing the cards to me, getting comfy on the couch and then he will tell me his letters and animals. I’ve already started buying Christmas presents and I bought him the game Elefun, which is 3 and up. I think he will enjoy that. I know Candyland and a lot of those other games are 3 and up but I don’t see him ready for those yet. Maybe he will be in 4 months when he turns 3! And of course he loves games on the iPad. He has over 20 games just for him and many of them are matching and memory games. He does really well with them and they are very interactive and fun. What games do you like to play with your toddler? 1. We ask that you follow all three hosts. That way you can keep up to date on future Toddler Talks. 2. Please grab the Toddler Talk Button and display it in your post or on your blog. 3. Stop in to other blogs that are linking up. Leave a meaningful comment if you visit, and follow if you would like. This link up is for families that have toddlers. Raising a toddler can be fun, crazy, exciting, and exhausting. Sharing what works for you could give other families another way to do things. Next weeks topic will be: Clothes: What clothes do you love to put on your toddler? Please – Before you Link up – This is NOT A BLOG HOP!! IT IS A MEME FOR PARENTS AND CAREGIVERS OF TODDLERS. If you aren’t going to post specific to this weeks topic, than don’t link up. Toddler Talk Thursday: Christmas Gifts for Toddler! Toddler Talk Thursday: 4 Favorite Pictures! Toddler Talk Thursday: What’s In Your Diaper Bag? Toddler Talk Thursday: Meals and Runaway Toddlers! My son is starting so sing the clean up song now. So cute! I can't wait to play board games with him someday. Z sings the clean up song and I had to ask for the lyrics because I had NO idea what he was singing! Thanks for highlighting my blog this week, it made my day! My son loves doing flashcards too. He'll bring them to me and tell me he wants to "do my cards." I wonder if my toddlers would buy cleaning up as a toddler games. Hehe. Wonderful post and concept! Thanks.